On Fri., Oct. 16 Belmont Law Review hosted its third annual symposium, titled Entertainment Law and Music Business in Transition. 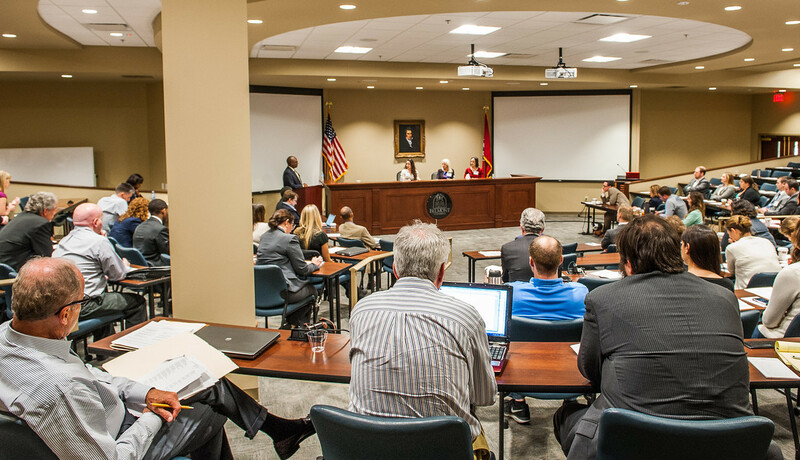 The Law Review was pleased to welcome members of the Nashville legal community, including many entertainment law practitioners, to discuss the challenges posed to current copyright doctrine by the fundamental changes in recent years to the way entertainment is created, distributed and consumed. The 2015 Symposium included presentations by Professors Brian Frye (University of Kentucky), Michael Epstein (Southwestern Law School), Yolanda King (Northern Illinois University College of Law), Mark Shultz (Southern Illinois University School of Law) and Belmont Law’s own Loren Mulraine, each of whom will be published in the forthcoming Belmont Law Review Volume 3. In addition, the event featured a keynote address delivered by U.S. Representative Marsha Blackburn, a discussion with Bart Herbison (the executive director of the Nashville Songwriters Association International) and a panel discussion around the impact of the recent Williams v. Bridgeport Music Inc. verdict, featuring local practitioners Sara Ellis, Ramona DeSalvo and Suzanne Kessler. Transcripts of these presentations will also be included in the upcoming journal.